Sci Fi > New Releases > Armchair Fiction > Single Novels > Armchair-New! Armchair fiction presents extra large editions of the best in classic science fiction novels, complete with original illustrations. 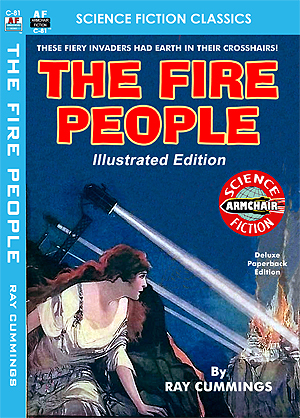 Here’s a great paperback edition of that space opera class, “The Fire People” by one of the masters of early science fiction, Ray Cummings. It was a fiery invasion from another planet! No one could have suspected that Earth was in mortal danger. It started with a small meteor streaking across the sky before smashing into the Earth’s surface. But the event was so much more than a simple collision between Earth and a wandering piece of space rubble. A strange glow began to radiate from the meteor, a glow unlike anything known to Earthly science; and with these emanations came death—horrifying, incendiary death—because anything coming into contact with that light was immediately destroyed. And soon the fate of Earth fell into the hands of an inquisitive newspaper reporter and a brilliant professor of science as they strived to save mankind from its first interplanetary threat—an attack on Earth from her distant neighbor in the sky…Mercury.